Noreen was accused of blasphemy against the Prophet of Islam and the Quran in June 2009, when she was working in the fields as a laborer in Sheikhupura. A religious argument broke out between her and her co-workers after she brought water for one of them. One of her co-workers objected that the mere touch of a Christian had made the water haram, or religiously forbidden for Muslims. Noreen was told to convert to Islam in order to become purified of her ritual impurity. Her rejoinder was perceived as an insult of Islam and hence she was accused of committing blasphemy. Muhammad Amin Bukhari, the Superintendent of Police who investigated Noreen’s case, testified in the trial court that the religious argument broke out over the drinking water, and not about the Prophet or the Quran. The trial court judge nonetheless convicted her and gave her the death penalty. Before Taseer could convey the petition to the president, his own police guard killed him Jan. 4, 2011 on account of his support Noreen and his characterization of the blasphemy laws as “black laws.” Two months later, the only Christian member of the cabinet, Shahbaz Bhatti, was killed. 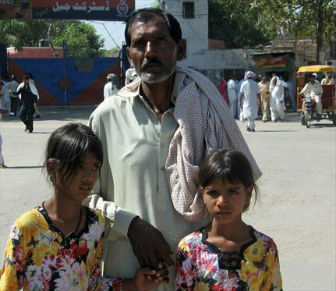 Bhatti had supported Noreen and sought to reform Pakistan’s blasphemy laws, which often are used to settle personal scores and pressure religious minorities. Most of Thursday’s four-hour hearing was given over to arguments made by Noreen’s counsel, Naeem Shakir. The judges, Muhammad Anwar-ul-Haq and Shahbaz Ali Rizvi, postponed all other cases scheduled for the day. The complainant in the case, Muslim cleric Muhammad Saalam, was presented along with a few other men in the court. Saalam was represented by a group of lawyers headed by Ghulam Mustafa Chaudhry, a Supreme Court lawyer and president of the Khatme Nabuwat (Finality of Prophethood) Lawyers’ Forum. Judge Anwar-ul-Haq brushed aside the trial judge’s observation, saying no judge in the world could infer whether “hot words” could be construed as blasphemy, or not. Shakir also informed the court that the original complaint, known as a first information report (FIR), had been lodged by the cleric Salaam five days after the quarrel. He argued that, during the trial, the only reason given for the delay was “deliberation and consultation,” and said Salaam had acknowledged this in the trial court. He said other appeals courts have ruled that if a delay in lodging an FIR is due to consultation and deliberation, the complaint should be dismissed. On Thursday, the appeals judges overruled Shakir’s argument, saying Noreen’s trial counsel hadn’t challenged this delay in the trial court, and therefore could not be taken up on appeal. Following the hours of argument, and without further deliberation, the judges announced “the appeal is hereby rejected,” which prompted jubilation among the lawyers representing the prosecution and Salaam, the original complainant.